Is PLCB Privatization Dead Already? After getting our best shot at dumping the ridiculous State Stores in years...Pennsylvanians may already be screwed. The Republicans in the state Legislature have lost their guts, and are lining up to give the PLCB bureaucrats everything they've asked for, apparently out of fear of union backlash (despite the fact that union households have consistently expressed support for privatization by margins of 2:1 in polls). Dammit! So...enough about my day, let's cut to the chase. Terry, of course, is not only a good friend and nice guy, he's also the former brewer at Bullfrog and currently at Farmer's Cabinet. He was hired to open an in-house nanobrewery for them, making one-off beers to complement their exotic beer selection. Well, Terry told me, they'd had real problems with paperwork -- city, state, federal? not sure -- and weren't sure when they'd be able to get the brewery up and running. So when someone noticed that Shenandoah Brewing was for sale (and about to go down for lack of a buyer), wheels started to turn. Shenandoah, you see, is Brew-On-Premise in Alexandria, Virginia. They are set up to do small batches, lots of small batches, exactly what Terry and the FC folks were planning. They have a ton of room. Amended here: I've been told that this is NOT a done deal, and I apologize for that. I thought I had checked on this, but I was wrong. Again: the purchase is NOT certain at this point. Seem crazy? It's not that far to Alexandria, especially if you travel at the hours Terry is used to anyway. It's a perfect set-up. And the options are endless. Not as convenient as it could be, maybe, but it has interesting potential. Yeah, yeah, I know: aren't these the same people who just closed two (or three, depending on how you parse it) places? Where'd they get the money to buy a brewery? Two answers: first, I don't know, and second, there's plenty of ways to skin that cat, even in this economy. And before anyone starts making trash comments about this situation...I won't allow them to post. Keep it clean, keep it reasonable, or you'll be wasting your time. Okay? Game on. Just got a press release from Victory Brewing about a new beer they are calling Otto, a bottle-conditioned dubbel...made with German hops (no big surprise there! ), Trappist yeast (and they've crossed those streams before too), Munich malt, Belgian caramel malt (yeah...and...), and smoked malt. A smoked dubbel, which they believe is unique. I tend to be very cautious about the use of the word "unique" with beers anymore; been burned too many times. But it's certainly not a common idea. Victory's done this kind of thing before, though; they've tipped a little rauchmalz into the mashtun for St. Victorious doublebock, which gave it a subtle depth that didn't even always come through as smokey. I'm looking forward to this. Otto will be out on October 15, in 750 ml corked-and-caged bottles, at a solid 8.1% ABV. Put it on your calendars. 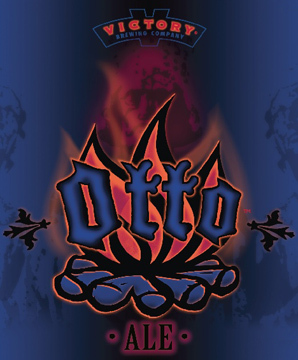 Oh, and it's "Otto" because of St. Otto of Bamberg, the town where brewery founders Ron Barchet and Bill Covaleski first had smoked beers in 1987, and where they get their smoked malt to make this beer. Nice. "Summer is no time to fuss with the petty details of wine"
One of the best things about Malt Advocate becoming part of M.Shanken Communications is that I got a comped subscription to Wine Spectator. I'm learning a lot about wine, and a lot about magazine design, too. But one thing I learned pretty quickly was to turn to Matt Kramer's column first, and the latest issue was no disappointment. That quote in the title of this post was the takehome for me, and it applies equally to beer or whiskey. Dude. It's summer, we're out on the deck, it's either the weekend or one's coming. Relax and enjoy. Or as Kramer said, "Even I, a professional wine obsessive, find myself during the warm summer season saying, well, to hell with it..." Yup. So I present my own version of his points. Rediscover pale ale. Sierra Nevada, or the new ones from Victory or Left Hand. Pale Ale is a drinker, not a thinker, and still great cold. Best of all, at around 5-6%, it's still big-glass beer. Yeah. Summer beers have returned. After being off the radar for a few years -- why? I don't really know, maybe brewers catching their breaths -- summer beers are back in a big way. Try that Citra-spiked Narragansett Summer in the big blue can, or the Stoudt's Kolsch, or whatever your local brewpub's got that's light and frisky. Hefeweizen! The summer beer that never, ever goes out of style. Don't want to go to the trouble of washing those big weissbier glasses? You're absolved, my child: go forth and pour hefe into any good beer glass you want. Want/don't want a lemon slice? Do as you please, and don't let anyone tell you different. Try something new. There are always beers out there you've never had, whole styles of beer you've never tried -- or liked, and maybe this is the time to give it a shot. Go to a bar, saddle up, and grab a new handle. You're out, you're drinking beer, you're having fun. Relax. This ain't no time to argue. It's time to enjoy. Grill. Chill. Tip a few. Sound good? Indeed. Just don't remind me of this when something pisses me off in July and I start ranting! Tonight in the Lehigh Valley: Session Beer! I'm joining Eddie Stoudt (yeah, that Eddie Stoudt) tonight at The Pickled Egg in Easton (and I gotta say: cannot think of a better name for a Pennsylvania Dutch area beer bar) for an evening of session beer. I'll be talking about this near and dear subject and signing copies of Pennsylvania Breweries, Eddie will have a fresh firkin pouring (I assume of Karnival Kölsch, but I'm not sure), and proceeds from the firkin will be donated by barowner Laz Melan to the Boys and Girls Club of Easton. Good cause, good times, good beer! Get more details here; hope to see you tonight, 7-10! Four Philly Beer Week events to go; hope to see you at one of them! Philly Beer Week’s winding down, but I’m just winding up! I’ve got four events in the next three days, and they’re big ones, and they’re all Pay As You Go, cuz we know you like that. Tonight: I’m teaming up with the folks from Gretz Beer for a Doylestown pub crawl, and it’s a beauty. Get all the details here, but I can tell you: it says 7-9, but things will start around 6:30, and I doubt it’s going to stop just because the clock says so. I’ll be at Penn Taproom* (80 W. State St.) with my buddy Mike Hiller from Bavarian Barbarian from 6:30 to about 7:15, then hustle over to Knight House (96 W. State) to hang with the good folks from Victory, and then wind up the night from about 8:30 on at Stephanie’s (29 S. Main) with a first-in-Pennsylvania debut of Urban Chestnut Brewing, a St. Louis micro started by Florian Kuplent, a very talented microbrewer who'd gone to work for Anheuser-Busch...then bolted when the Belgo-Brazilians came to town. Very much looking forward to that! I’ll be signing copies of Pennsylvania Breweries at all stops, too. Come on out! Tomorrow: Bust out of work early and join me at City Tap House for a Pennsylvania/session beer celebration from 11 to 2! We’ll have Pennsy beers pouring, Pennsylvania-local foods on offer (and they do great things with it over there), and I’ll talk your ear off about the great beers and brewers we have here in Pennsylvania. This one’s going to be fun; play hooky with me and show your disdain for all those neo-dry noseys who say we can’t have beer with lunch! Friday night is a great little event I’ve got going at Old Eagle Tavern from 8-midnight: Bourbon, Beer, and Lew Bryson. I’m not just a beer writer, I’m a whiskey writer too, so we’re going to pump things up with a series of bourbon-barrel beers and bourbons. We’ll be pouring Baker's (a big overproof favorite), Eagle Rare (at Old Eagle? We had to! ), George Dickel No. 12 Tennessee Whiskey (cuz if you don’t know Dickel, you don’t know jack), Elijah Craig 12 Year Old (a great unknown), and Makers Mark (gotta have something smooth). The bourbon-barrel beers? Oh, just a few kinda okay things, like Weyerbacher Insanity, Yards barrel-aged George Washington Porter, a 2009 Central Waters barrel-aged Barleywine, Allagash Curieux, and Port Brewing Older Viscosity. Interested now? I'll have plenty of free copies of Malt Advocate magazine, the world's best whisky magazine, too. Saturday: It’s Big Wood with Lew Bryson at Devil’s Den from 8 to midnight to wrap up my Philly Beer Week events, and it’s gonna be great. We’ll have some serious wood-aged beers in the house, done with a variety of wood-aging techniques I’ll be happy to discuss with you. Check out this list: Weyerbacher Heresy, Rodenbach Grand Cru 2008, Russian River Consecration, Dogfish Head Palo Santo, Firestone Walker Walker's Reserve, Great Divide 17th Anniversary, Boulder Planet Porter with dates aged in bourbon barrels, Lost Abbey Angel's Share, and Hill Farmstead Phenomenology of Spirit (a dark saison, brewed with friends at Tired Hands, McKenzie, and Hill Farmstead’s sister brewery, Grassroots in Denmark, primary fermented in french oak wine casks along with multiple strains of brettanomyces and resident microflora. Because we know you like things like that.) You also might get picked up by cameras working on a new project I'm involved with; so spruce up a bit. And that...will about do it. Whew. *and remember: 1-star Yelp reviews usually mean "and my ex-girlfriend works there" and 5-star reviews often mean "and I'm sleeping with the bar manager." Pretty Things event that I'm missing...why can't the college year be longer? If you've ever read a bottle of Saint Botolph's Town, you know that Boston is named after the 8th century saint by the name of "Botolph". Known as the patron saint of travellers, old Saint Botolph will no doubt look over us and perhaps cast his blessings as we "travel" pub to pub in celebration of his feast day. Come join us Friday, June 17th! This year we're moving our Botolph's crawl to Cambridge. Why not celebrate that fine city of Boston and it's patron saint from across the Charles? Okay, it may be slightly ridiculous but that's the way it's going to be! Some great bars, and delicious Pretty Things beers...and I got no excuse to be in town! The boy's just going to have to take a summer course next year. Meanwhile, I'll have to assuage my hurt feelings by dropping in at the Pretty Things event at Midatlantic Friday night. And yes, I've been busy during Philly Beer Week, but I still am, and when I have a moment...I'll post. Hey, I got a post from my friends at Finger Lakes Distilling (distilling's a hot job, you need a beer at times!) about the Finger Lakes Craft Beer Festival next week. It's on June 16, a Thursday, starting at 6 PM -- and if that's not a perfect excuse for a long weekend in the beautiful Finger Lakes, be damned if I know what is. It's an environmental benefit: "The festival is a benefit to increase awareness and facilitate monies to be donated to “Gas Free Seneca,” a local non-profit group dedicated to stopping LPG gas storage in the Watkins Glen area." I mean, there's at least six breweries on there I've never been to! If you've got the time, you oughta go; it's a beautiful spot, and bound to be some excellent beers. Wanted to get in a plug for an event I really thought would cut through the noise of Philly Beer Week, if only because so many people being repulsed by it: Scoats and I, with chef Kevin McDevitt, are putting on an all-smoked dinner at Hop Angel Brauhaus tomorrow night. The menu is below, and you'll notice: everything is smoked, even the dessert. I know a lot of you don't like smoked beers, but for those of you that do...this is smokin', baby. Please note the seafood course, where we have a beer that is technically not smoked (Schlenkerla Helles uses no smoked malt, but picks up smoke hints from the brewing system that otherwise does exclusively smoked beers), and the return of Unibroue Raftman, the best peat-smoked beer I know of. We've got some beauts here, and if you've never had Bruder Basil cheese...you're in for a treat. Come out tomorrow night. PAYG starts at 5, we'll have a more formal served dinner at 7 for $50 that includes all the beers and all the foods (at a significant savings). Just got a notice about another Deschutes Brewery event for Philly Beer Week. Sigh. This superlative brewery only comes to PA once a year, for a few weeks, on some weird temporary "registration," and then leaves. But while they're here...you oughta grab some. Join Oregon’s Deschutes Brewery brewmaster Larry Sidor for an evening of unbelievable beer, food and music. Deschutes is in town for Philly Beer Week, and doesn’t have regular distribution in our fair city – so this is a rare chance to sample some of their damn tasty beers. The evening begins at 5p.m. with an “ East Meets West” reception, featuring Deschutes Brewery seasonal beers Red Chair Northwest Pale Ale and Twilight Summer Ale. Also during the reception schmear of smoked salmon rillette with preserved lemon will be served to the musical sounds of the Carol Moog Trio. At 6 pm, the four-course dinner begins, pairing Deschutes ales with everything from salad to dessert. You’ll be feasting on such pairings as Mirror Pond Pale Ale with Locavore Salad; Obsidian Stout with Singapore Soft Shells; Black Butte Porter with braised goat mole; and The Abyss Imperial Stout with ginger gelato. Your palate will thank you! The London Grill, 2301 Fairmount Avenue, Philadelphia 215-978-4545. Sigh. Wish I could join you. "Golden Beer," it says on the Single Chair label, and I'm thinking, well, this is as about as exciting as it's gonna get. Truth be told, Single Chair is pretty light, but it might just be the ticket to get Uncle Freddy up Beer Mountain. Because the first sip is pretty tame, but by the second one, you're starting to realize that there's a twitchy zip of bitterness in there that you maybe missed the first time around. I'd have liked a bit more body, but it's not all bad. Give me a hot day, and I'd finish a couple of these. They're anchoring Magic Hat's summer assortment 12-pack, and it's worth it just to get to the Blind Faith IPA (do you remember Blind Faith? I sure do). Reading Karen Heller's Inky column today on the total Mongolian cluster-***k that is the Philadelphia school district, and being saddened by her main point, which is that this crappy school district -- out of control violence, cronyism, corruption, and a total lack of simple brains when it comes to budget planning -- is one more thing, a big one, that's crushing the whole Next Great City idea. There is a gash in the middle of the city's population. Philadelphia has been wildly successful in attracting younger adults ages 20 to 34, due in part to our central location, affordable housing, bike lanes, and, of course, eminence as a beer-imbiber's paradise. The city has more babies, and more baby boomers. A grateful city full of the people who have made it that paradise thank you for noticing...and for being cool enough to mention it. To be honest, it was the "of course" that was truly endearing. Now if we could just get some more brewpubs in the city...we might have something. Too bad neighborhoods still have this weird idea that brewpubs will destroy them. It's the other way around, just look at Denver!